Most of us appreciate Veterans Day for the additional weekend time. The opportunity to sleep in, join friends, or just leisurely while away the time is time well spent. A group gathering at Powerworks Park in DuPont has made a different choice. They are here to honor, remember, and to run. They have decided to participate in wear blue: run to remember and they make this choice each Saturday morning, whether it brings rain, shine, or cold November dawn. Co-founded by Lisa Hallett and Erin O’Connor, wear blue: run to remember began as a small group of military spouses running to support each other through the devastation of losing someone to war. 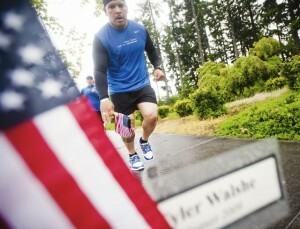 In honor of her husband, Captain John Hallett who was killed in action August 2009 in Afghanistan, Lisa has continued to nurture wear blue: run to remember into a national phenomenon while maintaining firm community roots here at Joint Base Lewis-McChord (JBLM). 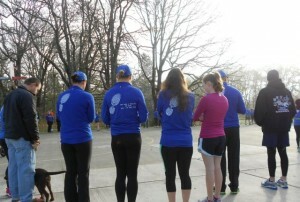 Lisa Hallett and other wear blue runners prepare for a moment of silence. Hallett co-founded the organization to honor fallen soldiers. In DuPont this morning, wear blue: run to remember gathers for their three-mile, family-friendly run. To the casual observer, it might appear as though people are here for a special event for the Veterans Day holiday. This, however, is a steadfast group meeting each weekend to honor the fallen. As if running more than twenty miles was not enough of a challenge, Bill Beadle, a marathoner who has been running with wear blue for a year now, carries a large American flag visible well above the crowd as he runs miles of road in tribute. 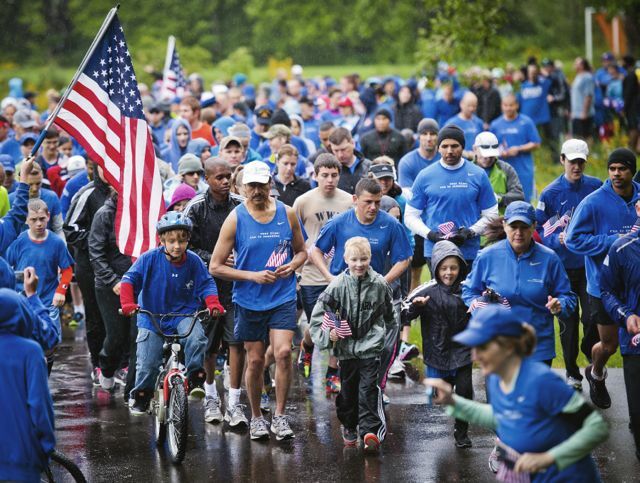 He describes the growing Saturday participation in wear blue with pride: “We almost always get at least one hundred, but for Memorial Day, we had up to one thousand people here.” Whether running, walking, or strolling, the numbers are inspiring. The surrounding community is also encouraged to participate. One simple way is through T-shirt sales and donations which are reinvested into the organization, helping to pay for flags and race registration. All here are volunteers. At Patriots Landing, a retirement community located along the running course, veterans and military retirees cheer on runners as they come by the water point placed there and marked with still more American flags. “It allows those who can’t run themselves to still be part of the run,” Lisa explains. While we each celebrate Veterans Day this year, many will think of the fallen service members we honor, but few will actively devote a day of our weekend to honoring the memory of these individuals. Wear blue: run to remember commits a day every weekend, and this committed community is garnering enthusiasts across the nation. Health and growth though gratitude and recognition is attracting many, military and civilian, to take part in this enriching recreation. 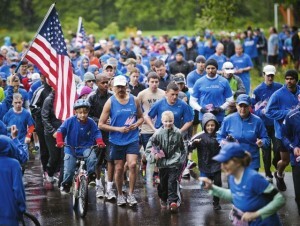 The official website, www.wearblueruntoremember.org, includes instructions for starting local chapters. Chapters of wear blue have formed throughout the country, first with JBLM, then Fort Bragg, North Carolina. Although not yet official chapters, wear blue has groups running in remembrance at Fort Leonard Wood, Missouri and Fort Carson, Colorado. By 8:45 a.m., only five or six people in blue t-shirts are standing near the picnic pavilion here at Powderworks Park, but the group quickly swells to fifty, and then by 9 a.m. over one hundred people have gathered, some with dogs on leashes, others pushing strollers or trailing kids also ready to run. One young man in the crowd wears a rucksack and boots. A boy, no older than ten, chats with other runners while wearing the picture of a man in uniform pinned to the back of his windbreaker. A Vietnam veteran walks through the crowd greeting friends. Rachel Elizalde-Powell, co-president of the JBLM chapter of wear blue: run to remember, hands out small slips of paper with the names of fallen service members printed on them. All seventy-three service members lost during this weekend since 2001 will have their names called this morning. Curtis Brake, co-president with Rachel, organizes the runners into a circle and calls the group to order. The nervous energy of cold people waiting to run subsides and a profound reverence takes over the park. A moment of silence passes and then each individual around the circle reads a name with eloquence and respect. Once the round is complete, Curtis asks the group, “Who else are you running for?” and additional names each will personally run to honor are proclaimed. Some call one, though many list the names of two or three lost loved ones and friends. As the circle is concluded for the second time, there is a beat of quiet as the sorrow is released and Curtis calls out, “Now, let’s go do something life affirming! Let’s do it for them!” Nearly two-hundred people wearing blue move out for a cold morning three-mile run.